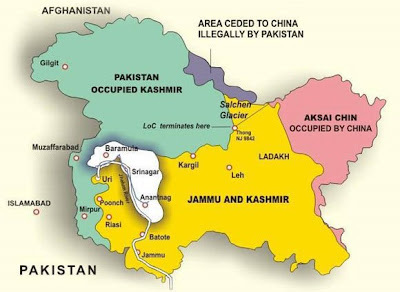 You are at:Home»Lex Pedia»Lex Articles»Article 370: Yesteryears, Present And Future Of Kashmir. The constitution of India came into force on 26th Jan 1950, and subsequently article 370 was inserted in Indian constitution, which gave Jammu & Kashmir a special status under the Union of India, after J&K signed Instrument of Accession with India on Oct 26, 1947. Under the Instrument of Accession only article 1 and article 370 of Indian constitution were applicable to J&K. The article 370 provided few sets of constitutional privileges to the state: A constituent assembly & separate constitution. The provisions of the Indian constitution in Part VI thereof would not apply to it and that the authority of Parliament to legislate on matters within its jurisdiction would not be the same as in respect of other States. This is what makes J&K a peculiar and unique state. After the British Empire fell, Kashmir, like all the other princely states was free to accede to either India or Pakistan. And given the religious and cultural similarities of kashmir with Pakistan and the proximity, Kashmir’s accession to Pakistan was obvious. But Maharaja Hari Singh had other plans. He was quite aware that if he acceded to either of the countries, he would have to relinquish his authority. So he chose to stay independent. While India and Pakistan had the taste of independence, there was status quo in Kashmir. The anger was brewing within J&K against the ruler, hence Hari Singh found himself in a tight corner. People of state were already tired of uncertainty and repressive rule. And in absence of British help which he was hitherto getting to suppress internal rebellion, Hari Singh was foreseeing himself being defeated and ousted by the people of Jammu & Kashmir. In September, 1947 J&K also saw a massacre of Muslims in Jammu, with active support from ruler’s forces. And as the news of mass slaughter of muslims reached Pakistan, it sent a several thousand tribesmen to gain rest Kashmir from the control of the Hindu ruler. Hearing the news of their advances, Maharaja Hari singh fled from Kashmir. With regard to the conditional accession and the aspirations of people of J&K, Pandit Jawaharlal Nehru and Sheikh Abdullah made their promises. Govt of India, white paper on Jammu & Kashmir, Delhi 1948, p.55. Article 370 has two parts and an explanation: It says President in consultation with state government will declare subjects in addition to three subjects mentioned in the Instrument of Accession on which Parliament of India may legislate. President in consultation with state Government issued the “Constitution (application to J&K) Order, 1954” which gave practically parliament the authority to legislate on all matters included in union list with few exceptions and modifications. Said order was amended many times like in year 1963, 1964, 1965, 1966,1972,1974,1986, inserting different changes; hence, diluting the basic structure and purpose of article 370. Now, Parliament of India and President of India can legislate with respect to any matter in Union and concurrent List. Owing to these orders and amendments, a state law is repealed when centre makes any law on matter concerned. However, residuary powers remain with state of J&K. Under Article 74, President can make orders on the aid and advice of council of ministers . Whether same can be done with respect to article 370 remains disputed. And the situation of J&k hasn’t really changed and Political Parties continue to politicize Article 370. The Status of Article 370 remains a hot debate among political parties in India and in Kashmir too. For repealing the article 370, President is required to order the repeal after recommendation from Constituent Assembly of J&K .This constituent Assembly ceased to exist after constitution of J&K was enacted, but it did not recommend the repeal of Article 370, hence a controversial status.